Looking for Ultrafine or Stay Fine Females? Since we are a small specialist stud we offer a small number of fine females for sale at anytime on our website, but have more available on request, including some ultrafine alpacas additional to any already offered below.  Please contact us for details & pricing for other proven ultrafine alpacas for sale, as well as a variety of females suitable for lower cost starter packages. 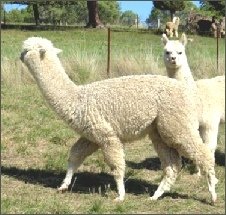 Now & again we have for sale some lower cost alpacas because they do not suit our breeding goals, are older, or because they have some minor issues. 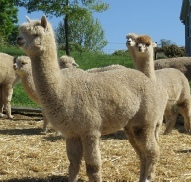 We believe these girls are still viable breeders but fully disclose to you why they are cheaper, so you can make purchase decisions based on full knowledge of each alpaca you buy. Shalimar has been one of our most successful dams for producing high quality progeny - having had 2 of her sons be of a high enough quality to become stud males, both with ultrafine fleeces - best of those being 14.6 mic 3rd fleece! She carries the bloodlines of several well respected stud sires and has maintained a fine micron stylish fleece for many years and also grows a good fleece length. Her early fleeces had exceptional style & she still exhibits a dense fleece with soft crimp definition. Shalimar is pregnant to the excellent stay fine male Eldendale Patric which with their combined first class genetics should produce a quality cria. Shalimar is an excellent mother & has an easy going temperament. Scarlet is one of the finest females for age in Australia. She is a well grown typey maiden female with an amazingly soft handling ultrafine fleece with soft crimp style. Her fleece is well nourished which is no suprise considering Scarlet is well fed here in dairy country & her body score is 3.5+! Scarlet has ultrafine genetics from both her sire & dam (21.6 mic on 6th fleece) who have both been blue ribbon winners for their fleeces. You will be hard pressed to find stats like this on a 1st fleece let alone a 2nd! She is a ALSO half sister to Oak Grove Taj who also exhibits exceptional fleece statistics with his 3rd fleece 14.6mic! Maiden female currently being mated to Elsendale Patric in May 2016. Mynka is a quiet attractive female who is a good mother. However, she does produce cria that are small to start then take longer than average to grow out. However her cria are nice, have lovely temperaments, stylish fleeces are finer than Mynka. Her female cria to Patric from 2017 had a first fleece of 15.3 micron, 3.6SD. Currently Empty but price includes mating to either Patric or Amadeus our elite stay fine males. 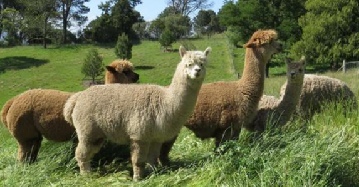 Oak Grove Alpacas sells all alpacas with a fertility guarantee unless stated otherwise. All alpacas are believed to be in good health & you are welcome to have them vet tested at your cost prior to purchase if you wish. All fleece statistics done whilst owned by us can be verified by histograms that you can view & receive a copy of with purchase. AAA transfer fees are included in all our prices unless prices are discounted for a custom package or otherwise stated & GST is not applicable. If you are new to alpacas or just want to grow your existing herd you may find some of these breeding packages worthwhile considering. 3 Adult females between 4 & 8 years of age. Colours will be white to dark fawn. Quality will be medium+ micron & average fleece style for age. 3 Adult females between 2 & 7 years of age. Colours will be white to light fawn. Quality will be fine to medium micron & fleece will have some style evident. * Packages may vary from examples above depending on suitable available stock. Some packages will include matings to our quality stud males & some females may be pregnant. We will customise a package to suit your needs & most budgets. 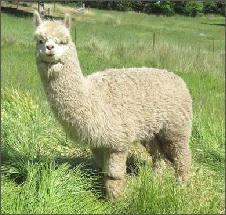 If you are new to alpacas it’s a good idea to learn about handling & breeding alpacas before you buy any. One on one beginner workshops available all year. Come and spend a day with us. We export to the UK & Europe - International enquiries welcome. Andalucia is a very sweet natured smaller framed maiden female. She has a well defined medium style crimp with very little guard hair. She is sired by our stay fine stud male Elsendale Patric & her grand dam was a stay fine female of a very high quality & exported to Europe, so she carries a wealth of fine quality genetics. AAA transfer included. Will be mated April/May 2019 - mating included in price. That’s 5 females guaranteed + one cria TBA! These girls are nice tidy animals with a mix of fleece styles & qualities. Good mothers with female cria at foot born in the last few weeks or heavily pregnant. DETAILS: 3 Solid White Females between 3 & 6 years of age from well regarded bloodlines - all with fine to medium fleeces grid tested. 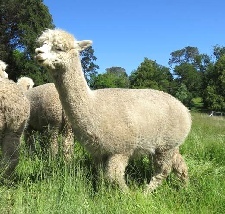 Two have white female cria at foot & one is ready to give birth within the next few weeks. This is an opportunity to get some quality foundation stock or build numbers in your herd at a very good price. Transport can be arranged for additional cost or free agistment here for 3 months until you can arrange collection. 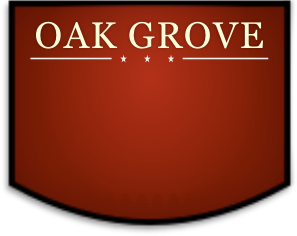 Package includes an option for half price matings to our quality stud males if required & matings are to be conducted at Oak Grove.